Oz Ferret is an internet community for ferret enthusiasts in Australia. This site is completely non-profit. 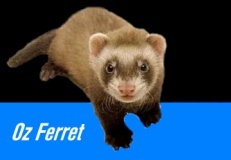 Oz Ferret was started in 2005 by Ken Moore as an online place for ferret lovers to meet up and share information. There is also a strong interest in ferret welfare which is helped by the participation of various Australian ferret welfare organisations. We have a small number of volunteers who assist with the moderation of our Pet Forum which operates from this site. Oz Ferret also has a keen interest in helping ferret groups in keeping an online presence and at the moment we assist by covering hosting costs for a few ferret sites including Ferret Village and the Victorian Ferret Society. Over the coming months and years we hope to build up into a gateway for the ferret community in Australia. If you would like to get involved drop Ken an email at ken@ozferret.org.au and be sure to tell your fuzzy loving friends about this site. Site copyright © Ken Moore 2004-2009.